Th-INK-ing of You: Always Remembered, Forever Loved! Hello friends! I hope you're having a great day! Today I'm sharing a card I made for the color challenge on SCS. The colors were real red, old olive and daffodil delight. I came as close as I could with my Copics, coloring this gorgeous morning glory image from the ODBD set, Glory. I added some white opaque gel pen dots to my flowers. I used Carried to Heaven for my sentiment, and punched out some yellow butterflies with a Martha Stewart punch. 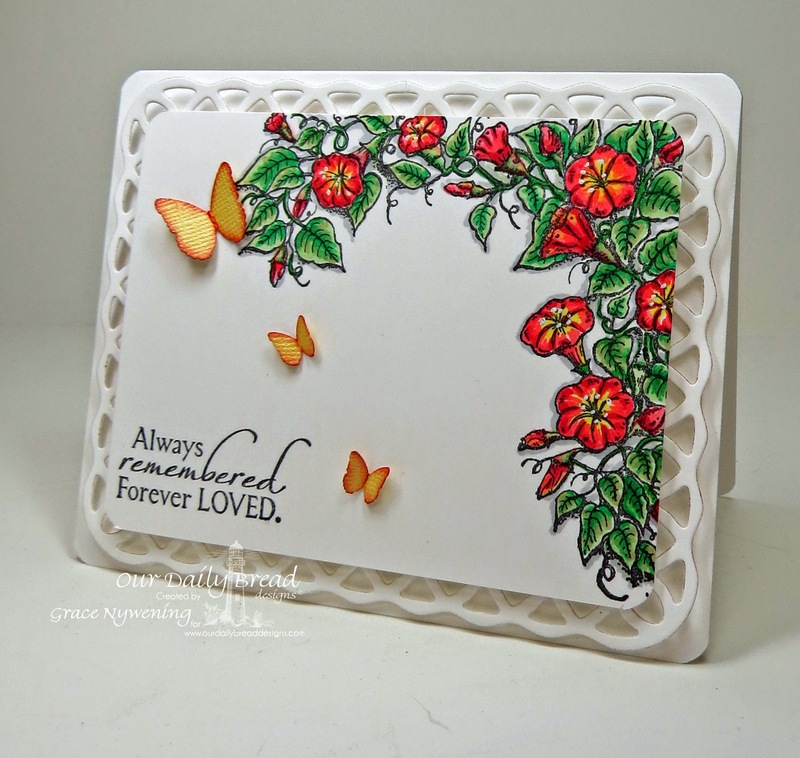 The lattice frame is from Spellbinders. I rounded my corners with a SU! punch. Each layer is popped up on foam dimensionals, and there are no embellishments so it's pretty flat and mailable!!! I am so happy to be finally getting comfortable in my own skin, so to speak, doing things more clean and simple! While I will always love my layers.... I don't really like one layer cards much.... yet I have come a long way in not having to embellish everything to the hilt! LOL~ One layer cards make me feel like anyone can go to the Dollar Store and get one of them for next to nothing, and I don't want to feel like I'm cheating the recipient of the added care a special hand made card requires. That said... I am finding a sweet spot somewhere between overly CAS and over done and expensive to mail. Well, that's a quick post for today.... I hope you like it and perhaps are inspired in some small way to step outside of your comfort zone, and whatever you do, to do it for the Lord! Oh, Grace, this is stunning! I love the layout and how it looks like a trellis with beautiful flowers and comforting verse! How wonderful for this week's challenge with ALL letters of "flower" in it! So honored to have you join us this week, sweet friend!! Hugs! Gorgeous card, Grace! It's so beautiful in it's relative simplicity! Wonderful coloring! Hugs! Lovely Grace! Thank you for sharing with us. I am sitting back and just taking in your handy work Grace. As much as I love your other cards I have to say that anyone who feels cheated getting a card like this has no appreciation of art. Your coloring is never in question. You have a wonderful sense of what is too much and not enough. You card in a word is Spectacular. Oh Grace this is amazing - I love the elegant and clean look you have going here, but it is still vibrant!! What a gorgeous card...love your white space with those beautiful florals and pop of butterflies!! I am glad you're becoming more comfortable with your own signature CAS look! !